Are your old phylloxera vineyard signs fading? 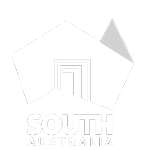 Vinehealth Australia has worked to modify Plant Health Australia’s biosecuity signs for non-consumer facing entrances. 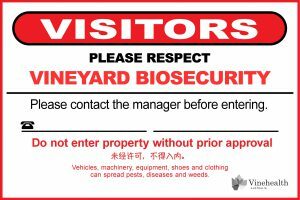 We have two simple landscape sign designs – ‘Vineyard Biosecurity’ or ‘Farm Biosecurity’. Signs ask visitors to respect your property’s biosecurity and to contact the manager prior to entering. Mandarin text has been included and reads: ‘Without permission, you many not enter’. Both designs are available in aluminium with a non-reflective UV coating. Signs come with four pre-drilled holes to assist in hanging. These signs are to be placed at ‘industry’ entrances to your property and are used across all plant industries, increasing recognition.